She was at the Dana Farber Cancer Institute (DFCI). I hope you never have to see those facilities. Or if you do, I hope it is from curiosity and not because you or a loved one is receiving treatment. Although was a bit challenging to go, being a cancer survivor myself and not wanting to be reminded, we accepted an invitation to tour the DFCI in late January. The facilities are amazing. So much attention is paid to how those with cancer are treated and what resources they can access. There are even places like the indoor gardens where they can experience nature that’s otherwise off limits due to their treatments. The tour guide even made mention of the unseen researchers and physicians working tirelessly to innovate new approaches for fighting cancer, to save lives, and to make a difference to all of us. 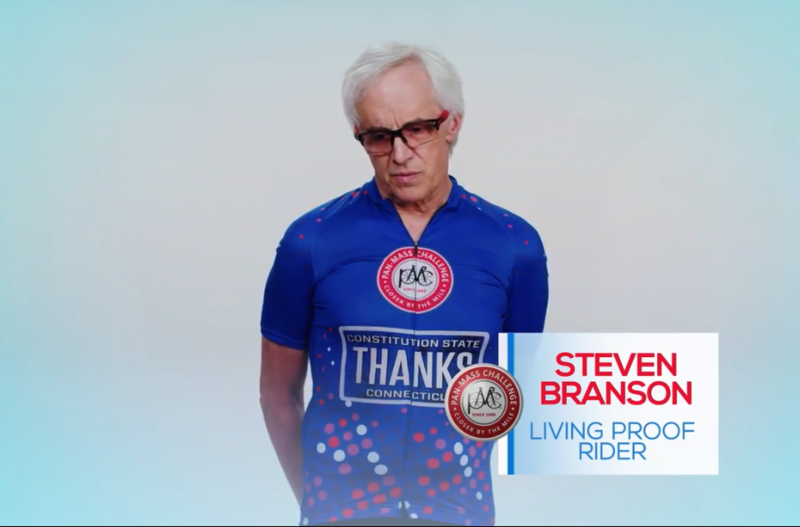 Over the past 40 years, 121,264 PMC riders (and 68,044 volunteers) have raised over $550 million to fight cancer at DFCI and in 2019, over 6,000 riders will aim to raise $58,000,000. With your help, we can make a real difference, saving lives. We can stand up and do something about this unrelenting and ever-changing affliction. This will be my fifth year and I’m asking for your support. I am off to a good start, having raised over $3,900, but I need your help. Please support my ride so others won’t suffer as Maddie did in the past. Click on “why I ride” and donate. 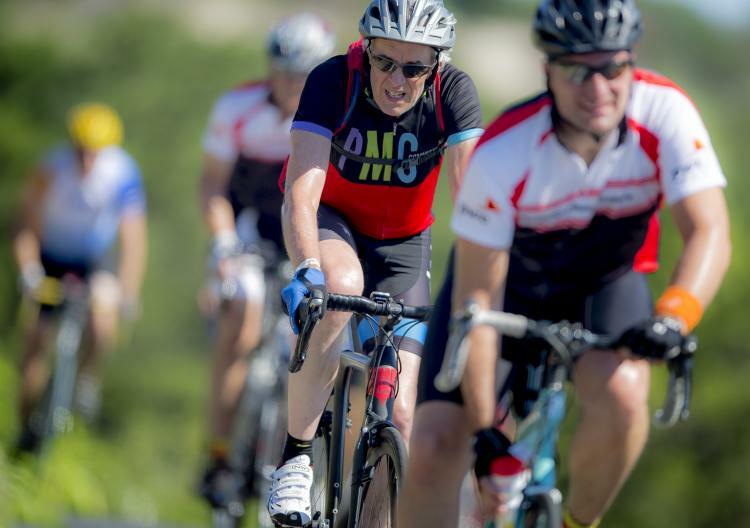 Remember, 100% of funds raised by the PMC go to Dana Farber for care, treatment and research. When asked the question, “why do you PMC,” I was not sure my reasons are special. Everyone faces cancer, either directly or with family and friends. But as I thought more, I realized I have a story about how I became such a committed PMC-er. I am a cancer survivor; I had a tumor removed from my cheek in 2003. The day I was told I had cancer changed my life forever. But that did not make me a PMC-er. No, I only donated when my friend Mark asked me to contribute to his PMC ride. But then, my best friend, Alan, was diagnosed with multiple myeloma. 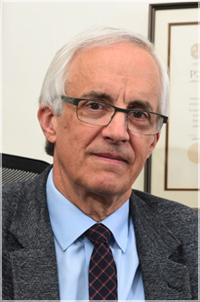 He had terrific care from Dana Farber. But, after three years, it became clear that he was on the verge of losing his battle to cancer and he was back in the hospital. At the same time, Mark sent an e-mail about his PMC ride. 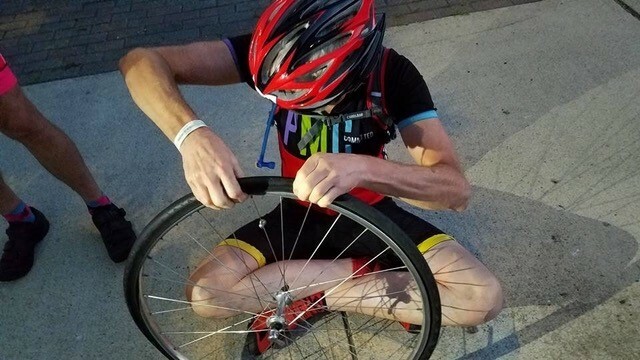 I said, “I’m in.” He responded, “to ride or to donate.” Initially I thought, “to donate, of course.” But, after some reflection, I responded, “to ride!” So, in January of 2015, I told Alan that I was building a road bike and riding in his name. He died a few weeks later. Keep in mind that I was a mountain bike rider, used to slow rides over rocks and roots. On my first time out on a road bike, I did 15 miles in an hour and thought it was such effort that I could not imagine ever completing the 192 PMC ride that August. So, I trained. And not only did I make that PMC ride, I have done two more after. Now, I am preparing for my fourth ride. In fact, I rode almost 4,500 miles last year to train for the two-day event in August. My commitment to the PMC ride gets more serious each year. Two years ago, I started working with a coach to train, and hired a dietician to eat better. And when Mark formed Team THANKS, I joined (learn more about Team THANKS here). This year, I helped design our team jerseys and shorts that we plan to wear on day two in August. 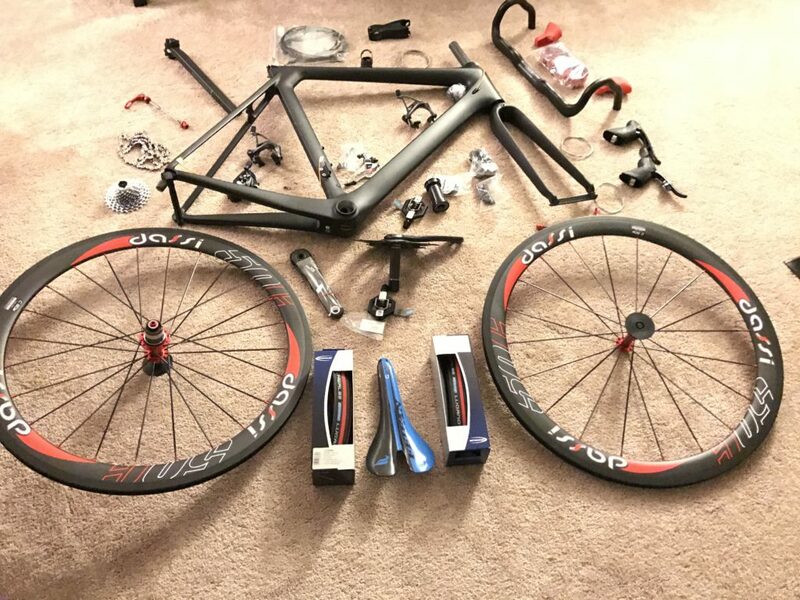 I have also built five carbon fiber road bikes for me and other riders. Our team has a pedal partner, who we thought was cancer free. But, this winter, we learned that she back in the hospital, facing a very tough battle with cancer that returned in a new form. When someone so young faces a painful, daunting form of cancer, it is heartbreaking. The I only way I have to deal with something like this is to try and raise more for the PMC!! So, that is why I PMC. me with Keven Lewis enduring to the end demonstrating how much we can all do!! 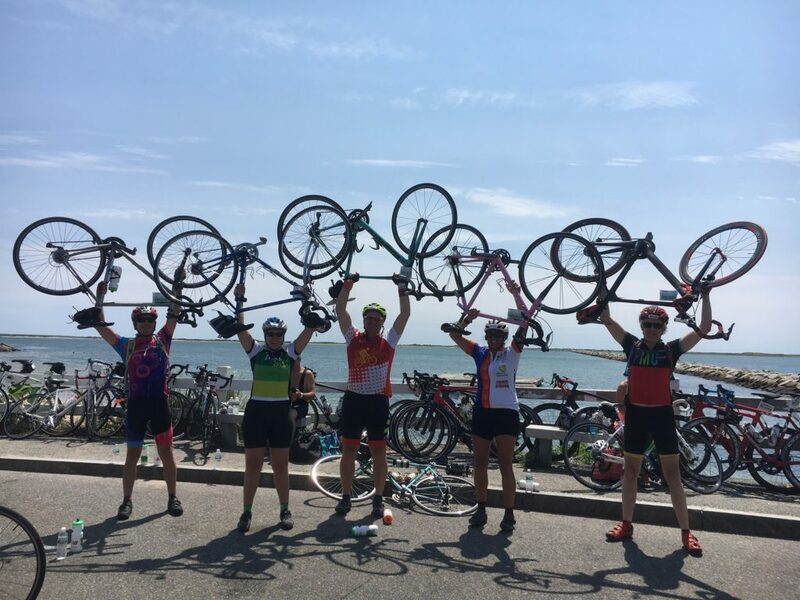 As promised, I wanted to let you know the outcome of the 2017 Pan Mass Challenge ride that took place last weekend. Team THANKS rode for the second year and had a 2017 goal of raising $40,000. Thanks to you all, we’re on track for hitting our stretch goal of $50,000 – every cent of which will be on its way to Dana Farber to help spark innovation in cancer treatment, save lives, and actually do something about cancer. This year, my nephew and two daughters took a year off but we added two new team members Kathy Carlson and Nancy Serpa. 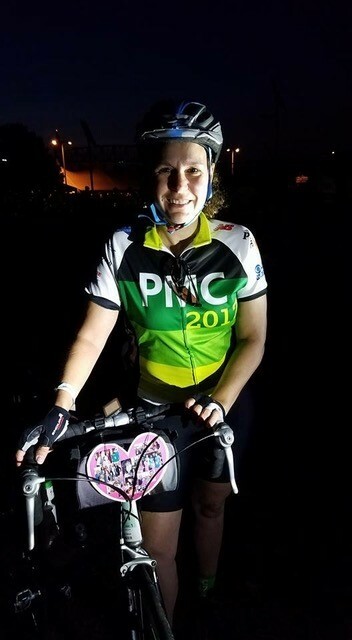 We met Kathy on the ride last year through the PMC Pedal Partner program. 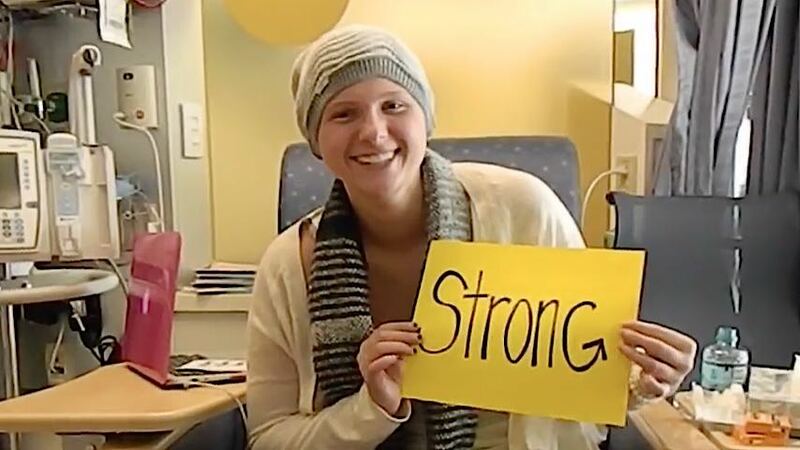 Her daughter Maddie was battling Ewing’s Sarcoma and is now cancer free. We encouraged Kathy to join our team this year and she did! Nancy has been a long time sponsor of our team, and lost her sister to cancer last year. 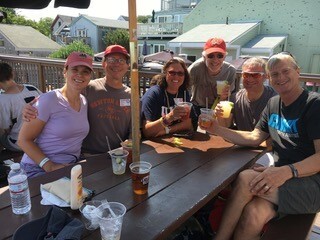 We also encouraged Nancy to ride with us to do something about cancer and she joined in for the Sunday leg from Bourne to Provincetown. 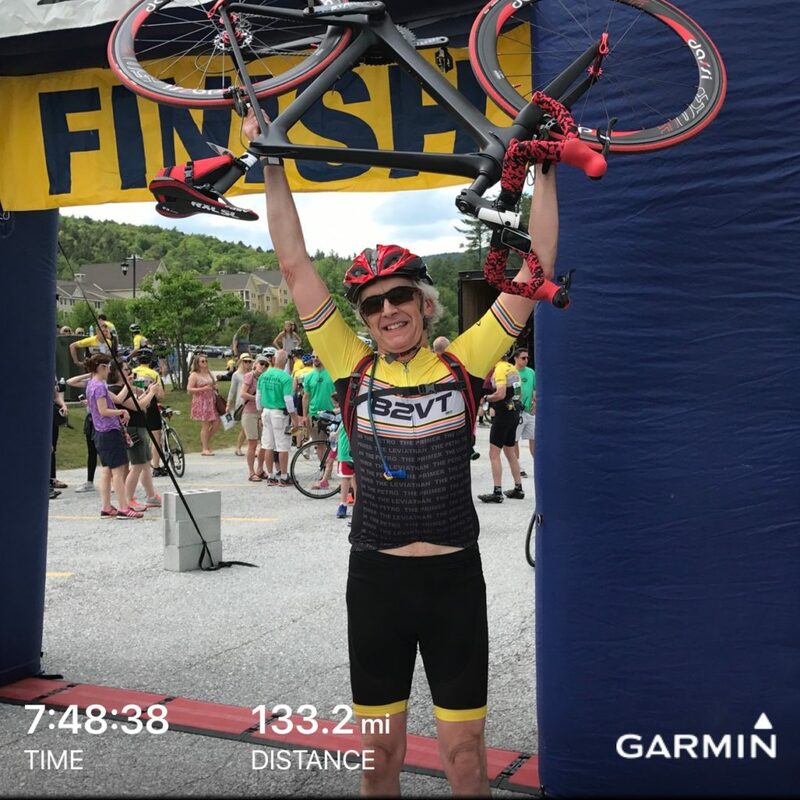 I crashed while training and had to sit this one out with a broken collar bone, but Jonathan Lilienfeld returned to ride with Kathy from Wellesley to P’town, while Steven Branson and Kevin Lewis rode from Sturbridge. The five of them met up in Bourne at the end of Day One to continue on to P’town Day Two. 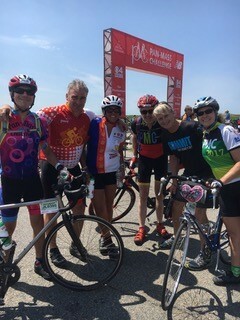 Here’s Kathy with daughter Maddie – our Pedal Partner – at the Lakeville stop on Day 1 with Kevin, Jonathan, and Paul Kennedy of Team PwC. 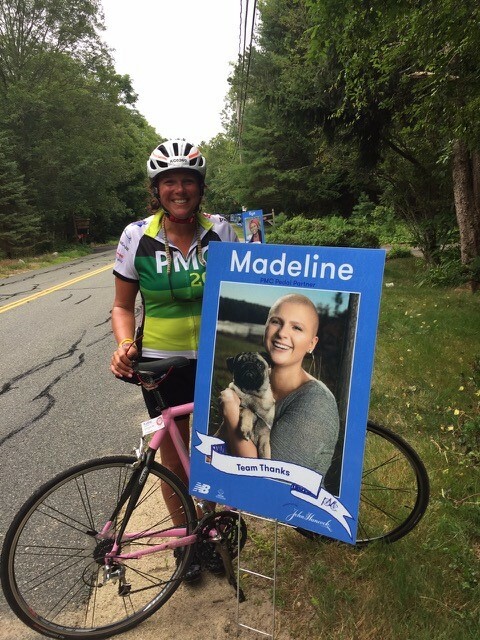 Here’s Kathy posing with Maddie’s sign at the Pedal Partner stop – what an amazing turn of events to see Maddie beat cancer, graduate from high school, and be getting ready for college in September – all with the help of Dana Farber, her family and friends, and generous people like you. But she hit a road grate in the dark that gave her a flat, and the team had to take over the rescue. 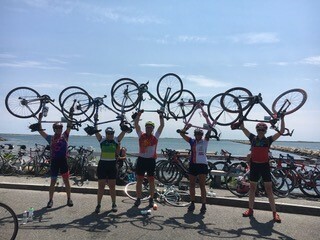 With that small bump in the road behind them, team THANKS took on the 20 mph winds of Wellfleet and finished strong at P’town! 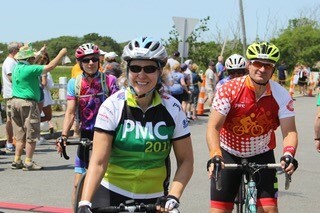 This victory picture has become a tradition for every PMC ride. Though I didn’t have a bike to hoist, I was able to join them all – together we did the hard part – raising nearly $50,000 (so far). 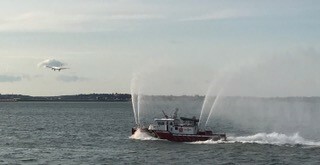 Jonathan, Kathy, Kevin, and Steven were treated to a hero’s welcome on their way back into Boston Harbor on the slow ferry. Thanks again for joining us – we couldn’t have done it without you. On June 10th, I rode the B2VT from Bedford, MA, to Okemo Ski Resort, Vermont. 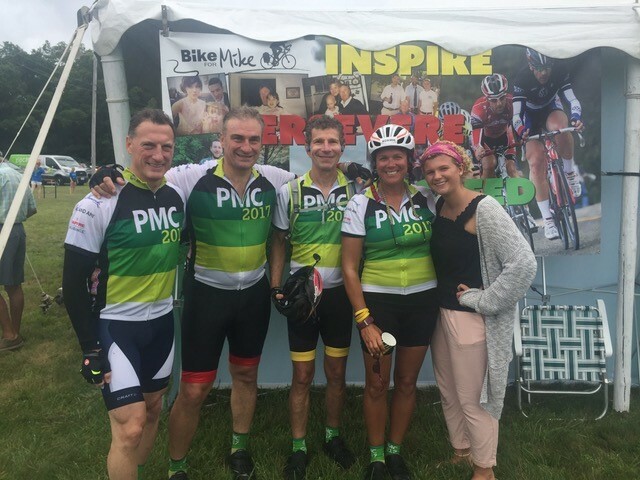 The 133-mile ride covers 20% more distance than day one of the PMC and has more than double the elevation change (please see my team salute photo above). I continue to train and promise to be prepared for the PMC weekend in August. 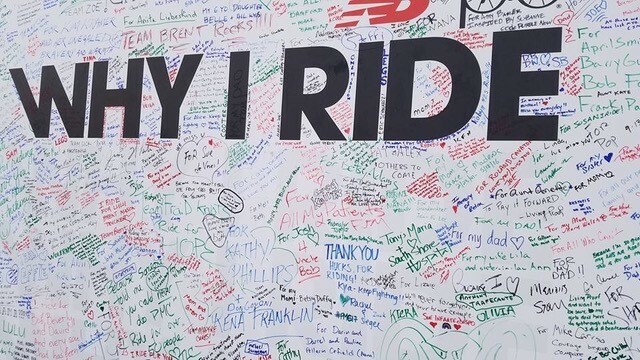 On that weekend, more than 6,000 riders and 3,000 volunteers show our commitment to raising money to battle cancer; 100% what we raise goes to Dana Farber for on-going cancer care, treatment and research. Please support my ride so we can help make cancer a bad memory; read “why I ride” and donate.